This is no laughing matter, so lets skip the levity. 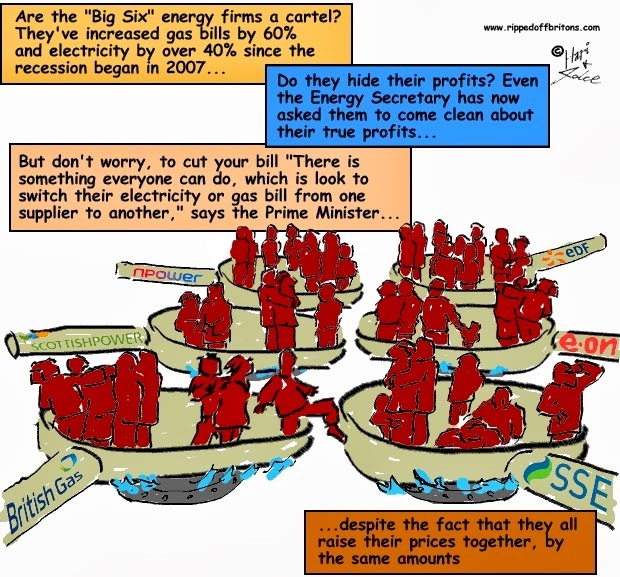 OFGEM, one of the few organisations in Britain that manages to make the FCA (formerly the FSA) not look uniquely cowardly and incompetent, has published some useful data! Is it OFGEM's Wikileaks moment? Is it a fat-finger accident? Or did they actually mean to publish this useful information? We like to think the best of everybody (we really do!) so lets assume they did this intentionally. Anyway, for the first time OFGEM is explicitly publishing wholesale energy cost data. The data explicitly and independently shows the energy companies have been telling porkies about the rise in open market wholesale prices in recent years. Wholesale gas price has gone up by 8%. NPower and British Gas have raised prices by upto 35%. To add insult to penury, because the wholesale cost makes up half the bill the mathematics says the percentage increase in bills should be half the percentage increase in wholesale cost. i.e. over the last 2 years wholesale costs would justify an extra 1% for electricity and 4% for gas. "If they're buying more expensive gas, more expensive electricity, in a large part we think this is because they're selling it to themselves". He should know, because OVO is not vertically integrated (i.e. can't buy wholesale energy from itself). So it actually does buy energy on the open wholesale market. The fact that the wholesale price increases for electricity and gas tend toward similar levels (30% & 35% respectively) despite different underlying cost growth (2% & 8% respectively) appears to indicate that levels must have been based mainly on what could be borne by consumers. In other words "what can they get away with"! If this can be proven would it support retrospective claw back of exorbitant profits - preferably imposed as a fine rather than windfall tax? The technical term for "what can they get away with" is "Market Price". Prices are never ever calculated from costs, and anyone involved in sales and marketing is taught this. Costs are only checked against prices to ensure that a profit can be made, and if cost is higher than sales price, they stop selling! Markets only work when there is transparency, I remember my first visit to America in the early 90's and noticing the car dealers quoting the factory prices of their cars so customers could work out the package, I was quite amazed because at that time it is not what I was being told here in the UK. It was the same with Gasoline prices I knew the US was very anti monopolistic and you could see the freedom from vertical integration in their supply lines. This is the complete opposite of "Market Price" this is "Market Rigging" and using clever media and opaqueness to obscure the Market. Idiots like you Geeve are the reason they get away with it! A fine or windfall tax would not put the money back in you pocket. Only way to do that is to now cut bills by 30% and demand refunds to cheated consumers. Lets see what Our Dave actually does-even with this evidence I guess --nothing. All plays into Ed's point "so can't go there". Just watch!